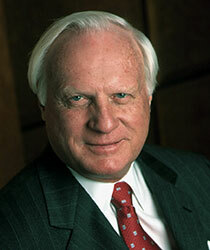 Charles W. Brady has served on NBR’s Board of Directors since 1993. Mr. Brady is Chairman Emeritus of the board of Invesco, Ltd., one of the world’s largest independent global investment managers. Operating through its primary brands, AIM, Invesco, and Atlantic Trust, the firm is dedicated to helping people worldwide build their financial security by providing a broad range of high quality investment products with exceptional customer service. Invesco manages $713 billion in assets for individual investors and sophisticated institutions, including governments, corporations, and not-for-profits. Born in Atlanta, Georgia, Mr. Brady graduated from the Georgia Institute of Technology with a Bachelor of Science in Industrial Management. He attended the Advanced Management School at Harvard University. In 1959, after serving two years in the United States Navy as a reserve officer based in the Mediterranean, Mr. Brady went into the brokerage business. In 1964 he joined a regional bank, establishing the first bank-owned registered investment advisory service in the United States. In 1978 Mr. Brady and eight partners acquired the business and founded Invesco. In 1988 Mr. Brady merged Invesco with the UK-based Britannia Arrow Corporation and was appointed Deputy Chairman of U.S. operations, and he became Executive Chairman in 1993. Mr. Brady merged Invesco with AIM Management Group in 1997, creating one of the first truly global retail and institutional asset managers. Under Mr. Brady’s executive chairmanship, Invesco has continued to gain leadership positions in key markets around the world, expanding its investment management capabilities for clients. A resident of Atlanta, Mr. Brady is active in local charities and community organizations. He is a trustee of the Georgia Tech Foundation, a member of the Advisory Board for the Scheller College of Business at Georgia Tech, a former member of the Board of Councilors for the Carter Center, and a former member of the Executive Board of Russell 20-20.